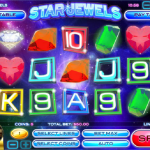 Star Jewels is a 3 reels & 10 lines slot game developed & powered by Rival. 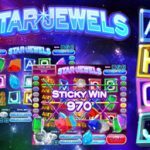 This is a galactic slot game placed in deep space among all the stars. 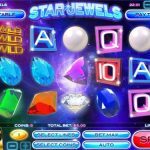 So there are stars of course but also gems like Diamonds, Sapphires, Rubies and Emeralds which you can also see in other slot games. The night is always beautiful in Star Jewels and when you spin the reels the stardust spreads around. This is a very fun slot game. No bonus stages but… there is a wild card. The expanding wilds will expand and fill the entire reel. They just stick there and trigger more spins and will remain there. The expanding wild cards are abundant so it is highly likely you will get them but they will appear only on reels 1 & 3. No bonus stage. But… there are wild cards which can complete combinations and trigger more spins each time it appears. So the theme is beautiful, the game is popular and fun. The rules are easy to remember and although there are no bonus stages the game is still very rewarding with all the wild cards flying around that make forming a winning combination an easy and achievable target!